At least that's what Ford told us. Although it’s not officially set to go on sale until 2018, Ford chose the 2017 Geneva Motor Show as the venue to display its next generation Fiesta ST hot hatch for the first time. Two things you need to know off the bat: Yes, a six-speed manual will be the only gearbox offered, and no, the three-door version you see pictured here won’t be sold in the US. 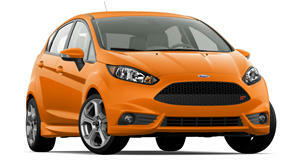 As is the case today, the US will have the five-door Fiesta ST only while Europe will have the three and five-door. But no matter, this new Fiesta ST picks up right where the existing car leaves off. However, the turbocharged 1.6-liter four-cylinder is being replaced by a smaller 1.5-liter three-cylinder, also turbocharged. One thing we were curious about is whether or not this change will negatively affect the hot hatch’s sound. "Not at all," chief engineer Tyrone Johnson explained to us. "In fact, the sound will be even better. It all matters on how you do the exhaust." Going back to the engine choice, why did Ford opt to go even smaller? "It’s very simple. Weight advantages, as well as emissions, and this is Ford’s first application of this turbo three-cylinder." Other noted areas of improvement Johnson mentioned are in the suspension, general comfort and stiffness. "However, it still has that same go-kart like feeling,"Johnson emphasized. And for the record, a Fiesta RS is still not happening, with either the outgoing Fiesta ST or the next one. "There simply isn’t a business case," Johnson clarified. "Plus, an all-wheel drive system would make the car way too heavy." We pressed Johnson for any official 2018 Fiesta ST specs, but was told those will all be coming later this year.